Last week’s posts seem mainly about the topic of inspiration. For me, the inspiration to become a writer came from one and only thing: reading. introduced characters and themes that demanded to be revisited and rediscovered at different junctures in my life. One of these books – The Phantom Tollbooth – may have had the same effects on you. I found it on a recent trip home to New Hampshire, underneath a stack of old books, and instantly began reading it and remembering all over again why I became a writer. Chabon is author of The Amazing Adventures of Kavalier & Clay, The Yiddish Policemen’s Union and Wonder Boys, among many other novels, short story collections and essays, and this quote comes from his updated introduction to the 50th anniversary edition of The Phantom Tollbooth, which arrives in October. For those who haven’t read Juster, or re-read this book in a while, The Phantom Tollbooth introduces the reader to Milo and an assortment of characters, such as the Whether Man, Tock the Watchdog, King Azaz and the Mathemagician, the Everpresent Wordsnatcher (who takes words right out of your mouth) and the Terrible Trivium (who surely haunts adults as much as children). As with venturing through the looking-glass with Alice, paying your fare at the tollbooth takes you on an adventure that trusts you to think differently, play fairly, reserve judgment, and understand what’s happening without the intervention of an adult – heady stuff for a child. 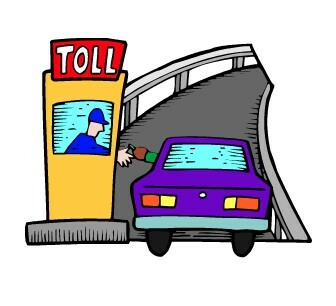 Tollbooth isn’t all dark and danger-filled. There are feasts and castles in the air and language everywhere. Near adventure’s end, King Azaz, whose name is itself a pun, and his brother, the Mathemagician, remind Milo that “so many things are possible just as long as you don’t know they’re impossible.” That is as true with language as it is in life. Updating to add that The New Yorker in its Oct. 17, 2011, issue sits down with author Norton Juster and illustrator Jules Feiffer for this lovely interview. This entry was posted in Reading and tagged reading, The Phantom Tollbooth by Vickie Bates. Bookmark the permalink.